Oscar Pistorius was released from custody after winning the right to avoid imprisonment until his trial for the murder of his girlfriend Reeva Steenkamp, a South African court decided on Friday. A four-day hearing culminated with shouts of "Yes!" when chief magistrate Desmond Nair announced he was granting the Blade Runner bail. Pistorius, who kept his head bowed when Nair announced his ruling, was ordered to post $1 million South African rand – $112,771 U.S. dollars – as surety and surrender his passport to prevent him from leaving the country. Not allowed to return to his home in Pretoria, Pistorius has reportedly gone to his uncle's house in Waterkloof, a suburb of Pretoria. "We are relieved by the fact that Oscar got bail today," Pistorius' uncle, Arnold, told reporters outside the court house, "but at the same time, we are in mourning for Reeva Steenkamp and her family." Although Pistorius, who claims he mistook Steenkamp for an intruder when he shot her through a bathroom door on Feb. 14, still faces charges of premeditated murder and could receive a life sentence, this outcome after four days of testimony is a major victory for the 26-year-old and his legal team before they are due back in court on June 4. Among the stipulations of his bail, Pistorius was also ordered to surrender all his firearms, must appear at Brooklyn Police Station (where he had been held) every Monday and Friday, may not enter any airport, cannot talk to any witnesses and is not allowed to drink alcohol. • Why didn't he ascertain Steenkamp's whereabouts? • Why didn't Steenkamp answer back when he allegedly shouted to someone in the bathroom? • Why didn't he verify who was in the bathroom before firing? The international posse of media and a global audience has heard nothing from Pistorius himself, unless you count a written affidavit that was read in court by his lawyer on Wednesday. But the athlete wanted this bail decision desperately, and as Nair handed down his judgment on Friday, it must have meant as much to Pistorius as any of his triumphs on the track, where he became the first double amputee to compete in both the Olympics and the Paralympics. Pretoria Central Prison, where he would have been sent back if denied bail, is by all accounts a godforsaken place – a dirty, noisy, violent, crowded, dangerous and soul-destroying jail that no one, especially a famous, white, wealthy, amputee superstar would want to spend his time. Yet even more significantly for Pistorius' potential future liberty is the reality that under South African legal regulations, defendants who are bailed are widely considered to have significant advantages come trial time. "It is hugely preferable for the defense to have the accused out on bail rather than being incarcerated," legal expert Manny Voets told 567 The Cape radio. "If the accused is in prison, you have to schedule appointments to visit, there is limited time and you are in a small room. "Being out of prison is much easier. He can be seen in chambers and the preparation for defending the case is just much smoother. It is definitely preferable and can be very important in cases." 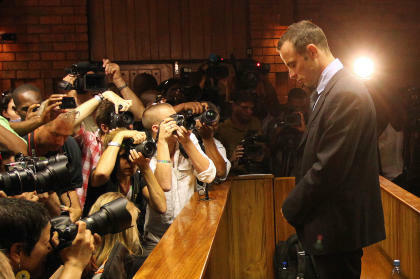 Pistorius will be relieved to be out of Pretoria Magistrates Court, where he spent four tense days under heavy scrutiny, much of it in floods of tears. While Pistorius could often maintain his composure during the more technical aspects of the legal deliberations, he would generally break down into sobs and gasps whenever assertions from either counsel turned to the actual events of Valentine's Day morning. His equilibrium was tested fully on Friday morning, as prosecutor Gerrie Nel began his final push for the denial of bail by going firmly on the attack. Nel was adamant that the prosecution would assert Steenkamp had fled to the bathroom at Pistorius' luxury residence in the Silver Lakes community either to "escape an argument or a gun." He also claimed Pistorius may have had his defense – his belief that an intruder had entered the house – prepared before the actual shooting took place. "I have my gun, I want to shoot her, and when they ask me, I'll say it was an intruder," said Nel, giving his interpretation of what he believed to be the runner's mindset. "As soon as they confront me, I'll say it was a burglar." Pistorius' sister Aimee and other members of his support looked disgusted at the suggestion, and were similarly unimpressed when Nel insisted he posed a flight risk, highlighting his access to a property in Italy where he has regularly trained during the European track season. Nel likened the matter to that of WikiLeaks founder Julian Assange, still holed up in the Ecuadorian embassy in London and avoiding extradition to Sweden where he is facing allegations of sexual assault. After Nel also issued stout criticism of Pistorius for not personally taking the stand, defense counsel Barry Roux argued for a charge of culpable homicide, a lesser charge than murder, and claimed that any intent to kill an intruder could not be read as intent to kill Steenkamp. Roux also pounced on the holes in the evidence put forward by the stumbling testimony of Botha. That disastrous second afternoon for the prosecution marked the turning point from which the prosecution could not recover. The bail ruling opens the possibility that Pistorius could return to athletic training, with his running coach Ampie Loew insisting he would like to see the 400-meter star back in training as early as Monday as a means to shifting his mind onto more positive things than the bloody events of Valentine's Day morning and the fatal shooting of Steenkamp. • Was this NBA trade deadline the worst ever?